We are open for tastings Monday through Saturday by appointment only. Join us for a behind the scenes experience as you discover the wines of Mi Sueño. Your seated tasting will take place in our intimate cellar surrounded by barrels of aging wine. Due to the cool temperature in the cellar, we recommend bringing a light jacket for your comfort. Your experience will last approximately 60-75 minutes. Please make your reservation below or call us at (707) 258-6358. Enjoy a seated tasting of our Mi Sueño portfolio on which our winery was founded. You will sample five of our current releases while learning about our history and journey of Rolando and Lorena Herrera. Many of the wines available are not distributed and sold exclusively at the winery. For each two-bottle purchase, one tasting fee is waived. 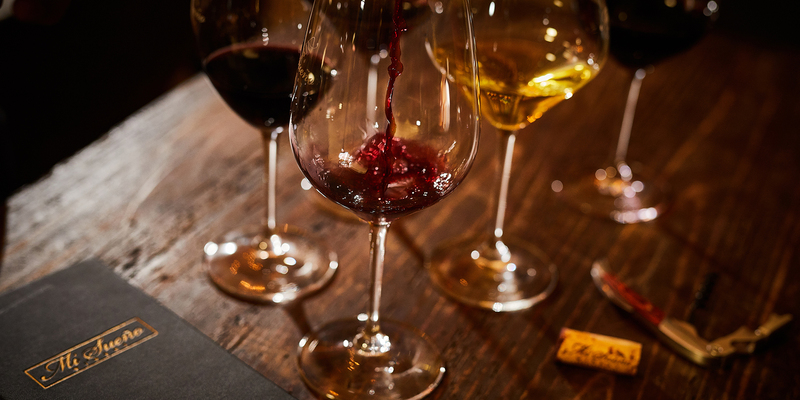 A seated tasting, indulge in our most exclusive wines and taste five current releases from our acclaimed Herrera portfolio. Each wine is a selection of the best grapes of the vintage and is sourced from a single vineyard. Due to their limited production, these wines are only available for purchase by joining our Herrera Club. Join today, receive up to 4 complimentary tastings during your visit.